As a young college student who was raised and taught the importance of the Civil Rights Movement, I have to wonder why those in positions of power within the community refuse to acknowledge the almost whitewashing of everything committed by our forefathers. I’m not calling it a complete racial moment but when hyper-conservative Glenn Beck spends every Friday of his show appeasing to African-Americans and then holding Beckapalooza on the steps of the Lincoln Memorial in a similar fashion as Martin Luther King’s “I Have A Dream” speech, distorting the message is the least of our worries. Awareness as a whole to certain issues is at a complete low. The focus on entertainment and gossip has skyrocketed to the point where talking about important issues seem taboo. Beck’s event in Washington was marred by many mistakes, with the glaring one being the inclusion of Sarah Palin. Recently, Palin made comments defending Dr. Laura over her usage of the N-word, calling the radio show host’s admittance to step down from her program, “a violation of her 1st Amendment Rights”. What can easily be inferred from such statements from the former governor of Alaska is that saying the N-word is fine by her, taking the approach as long as its evil and doesn’t directly affect her – she can champion it. I get the point that Beck’s message was trying to bring America back to a moral center but using prop awards and holding the idea of “Restoring Honor” to America’s armed forces was a complete reach. It was so hollow point that even trying to be an apologist by using gospel choirs and singers to bring some “soul” into the event made the entire thing seem like a dog and trick pony show. Beck even reached so far to square his message by using Alveda King, the niece of Dr. Martin Luther King and a widely known conservative to deliver the keynote address. By utilizing King, it gave the event a name and a face. King received warm applause for her efforts but it will mostly be forgotten in the annals of time due to the fact she is only involved with this “event” by name association, a name that shouldn’t be part of this discussion due to her words on CNN proclaiming “she was tired of the civil rights movement”. For a group so squired with “knowing the facts”, I doubt any of those who attended the rally were aware that the King speech in 1963 was a call to action on unemployment and equal rights. In 2010, there is very little equal about the rights seeing that blacks are highly more likely to either be imprisoned or murdered than whites and are having their moments in history and their historical figures wiped out of textbooks in Texas and won’t be involved in any classroom discussions in Arizona. Beck contends that King was an American hero but King wouldn’t agree with many of the points Beck attempted to make by connecting God and Country. I thought this wasn't about politics? There’s a difference between preaching because you are called to do it and use your power to try and bring forth change and inspire people to continue that change instead of using God as a platform to proclaim a country is this and that. Even in the Declaration of Independence you can see God and Country battle within the first passage, “We hold these truths to be self-evident that all men are created equal with certain inalienable rights”. I guess they missed the memo when slaves weren’t exactly involved “all men are created equal” notion? For those that African-Americans do listen to, radio broadcasters and entertainers, where were they on this day? Were they too concerned with gossip and general apathy towards anything that doesn’t directly concern them? Or were they so rooted in concert promotion and the latest gossip of the day? Beck’s rally on Washington affects everyone because it’s a voice trying to alter what the Civil Rights Movement actually stood for. It wasn’t placing God and country together side by side in union; it was men and women utilizing their voices to take stands against injustices some decades old. If Beck wants to reclaim that, maybe he should actually read what happened with King’s speech and how he had to make the speech before sundown due to contentious police efforts in DC that day. If that history hasn’t been removed already. 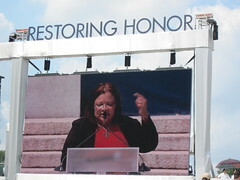 alveda kingcivil rights movementeditorialglenn beckpoliticsrestore honor rallysarah palinwashington d.c.